To this date, there remains a lot of confusion about the ability of People’s Bank of China (PBOC) to ease monetary policy. It has been constrained by what it appears to be a money outflow, which tightens liquidity within China automatically. The PBOC used to create money mainly as a result of foreign exchange intervention. During the time when there was huge pressure for the Chinese Yuan to appreciate (in part due to trade surplus and persist foreign investment, and in part due to hot money), the PBOC intervened to prevent the Yuan from appreciating too quickly. It “printed money” to purchase foreign currencies. This was how the foreign reserve accumulation worked for China, and the balance sheet expansion of PBOC was mainly driven by the increase of foreign assets. Besides the observation that most of the PBOC assets are foreign, it has become obvious that the pace of balance sheet expansion has slowed. The first notable and persistent slowdown in balance sheet expansion happened during the 2008/09 financial crisis, when the pace of PBOC balance sheet expansion slowed from well above 30% yoy to around 10%. The most recent slowdown of the pace of balance sheet expansion is happening right now, by less than 3% at June 2012 compared with the same month last year. The source of the current slowdown in balance sheet expansion is very obvious, which is the end of foreign assets accumulation. Central bank balance sheet expansion is one way of easing monetary and financial conditions, as we now all know in the QE-world. The chart above tells you that PBOC has stopped using its balance sheet to provide monetary accommodation, and this is not intentional. This last point is the most important. While most of these outflows are not in any way encouraged or intended by the government or the central bank, some have argued that outbound investment is encouraged. One report even claimed that capital account deficit was “an intended result”. Recently, Barclays Capital also pointed out that outbound direct investment is encouraged and supported by the government. However, even if some forms of outflow are “intended” by government policy, that does not mean the result poses no negative consequence on liquidity in the Chinese banking system. Chinese companies might be doing acquisitions in other countries, thus they need to purchase foreign currencies and make acquisition, contributing to the money outflow we have been seeing. However, a US$100 million outflow as a result of one rich household emigrating is the same as a US$100 million outflow as a result of a Chinese company making an acquisition in the United States. Whether the motivation of outflow is sinister or not makes no difference at all. They have the exact same effect on the PBOC’s foreign assets. Indeed, some of the money may not have really been moved out of the country (even though it shows up as if it were “outflow” in some accounts), but sitting in Chinese banks as foreign currencies deposits as companies start accumulating US dollar as they expect Chinese Yuan to depreciate. Nevertheless, the impacts of outflow, outbound investment, weak foreign investment flow, accumulation of foreign currencies by households and corporations, and households moving money away for emigration on foreign assets of the PBOC are the same. There is absolutely no point to distinguish the sources and motivations of various outflow as far as this big picture view is concerned. I have to stress that the current pace of outflow is slow so its negative impact on the size of foreign reserves is negligible, although it has effectively stopped the PBOC’s balance sheet expansion. But if the situation worsened (which is very possible), foreign reserve held by PBOC will eventually shrink much more meaningfully and conditions will tighten. 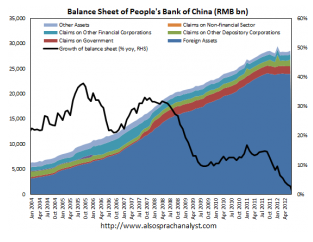 At the time when China is slowing down more than most pessimistic forecasters thought, the lack of central bank balance sheet expansion, which is an entirely unintended consequence, is unfortunate. Liquidity is tightened as bad loans increase, and the capital flow condition is no longer forcing PBOC to create base money in a way it did, which contributes to another source of tightening. This is a very negative development for the Chinese economy. Unless the PBOC at some point utilises other ways to expand its balance sheet in a much more substantial way, such a large scale asset purchase programme, PBOC will remain constrained in its ability to expand its balance sheet as it did, and cutting reserve requirement ratio and conducting reverse repo in a piecemeal fashion will likely be inadequate. There are other ways to circumvent this problem, if China does want to ease further. Previously sterilised funds inflow can be un-sterilised by cutting reserve requirement ratio aggressively (until it can be cut no further), reverse repo can be conducted more frequently and at larger sizes, central bank bills might be redeemed, and eventually going down the route of large scale asset purchases programme, i.e. quantitative easing as we know it. There will be other implications, of course, and the more aggressive it gets, the more other considerations have to be taken into account. For instance, the Yuan might be made weaker by a large scale asset purchase programme, and the perceived depreciation pressure might trigger even more funds outflow. The government (as well as the public) might also be worried about the risk of high inflation (although we believe there is no such risk in the long run due to massive overcapacity). The possible impact of a large scale asset purchases programme remains, for the moment, a matter of speculation, and despite the theoretical possibility, it is hard to conceive at the moment. But there is one more fundamental problem China is facing which compromises monetary policy further. We all know what happened next. The corporate sector deleveraged after the real estate bubble burst, while the government went into massive deficit spending for years which helped to avoid any dramatic contraction of the economy. Deleveraging might have been finished for Japan’s corporate sector, but the public sector’s deb-to-GDP ratio has well exceeded 200%. This is not a very surprising result. Government debt levels often rise after a severe recession, particularly after a financial crisis. The level of debt in China has long been a bit of a mystery, and it is not inconceivable that it is much higher than the chart above is suggesting. However, getting the debt level precisely right is hardly the main issue here. Rather, the issue here is what implication it has on the effectiveness of monetary policy. 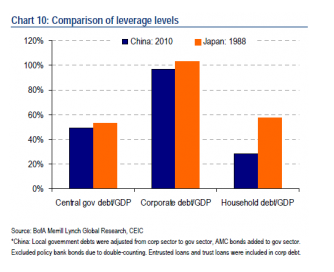 The problem is that with corporate debt level at about 100% of GDP (previously estimated that at 107% of GDP), with massive overcapacity and low returns on investment, the level of debt is unsustainable, and that means the corporate sector will need to deleverage. For the purpose of argument, let’s assume that without any government intervention and fiscal stimulus, economic activities will slow much further than what we are currently seeing, and that is going to impact employment and income of households. Thus it does not seem reasonable to assume that households can possibility pick up the slack, by borrowing more and spending more, especially as we have a real estate market that will eventually fall much further despite recent resilience. Without any government intervention and fiscal stimulus, demand for credit will be extremely weak as the private sector deleverages by repaying debts and/or default. It is true that the Chinese banking system has a slight liquidity issues her, and credit standards is getting higher as perceived risks are high, and that should have contributed in part to the generally not-so-great loans numbers we get on a monthly basis. However, even if the PBOC cuts RRR much more aggressively, eventually cutting rates to very low level, and performing large scale asset purchases to ease liquidity in the banking system and bring down interest rates, we suspect that in such a debt deflationary environment, demand for credit will remain low. If this happened, the government will need to step in much more aggressively to stimulate the economy at both the central and local government levels, and increased government debt level massively to offset corporate deleveraging. This entry was posted in China, Currencies, Guest Post on August 27, 2012 by Yves Smith. Did you really think China was going to dilly dally during its downturn, and not come with the muchacha? No siree. Yesterday, China announced it was unveiling an awe inspiring $1.4 trillion fiscal stimulus package. The southern-central province of Guizhou, sort of the Alabama of China, alone is getting 470 billion dollars. That right there is more money than the entire United States got from the VERY contentious “Obama/Pelosi stimulata –if you subtract those fabulous, but let’s face it, ultimately fatuous, middle-class tax cuts. It’s nice being a country and having control of your own money. When you control your money, you have the ability to at least make concerted efforts to shape your destiny. Hey, ask Spain, ask Greece, ask all those poor dumb peripheral Euro countries that don’t control their money, how they like standing naked and helpless before the whims of whimsy. Hell, ask the biggest dummy of them all, the United States. The big difference between China now and Japan in the late 1980s is that China will probably have another 20 plus years of 8% or more annual growth in the future. This will make any problem China faces now temporary. 8%for 20 years is a pretty agressive target considering that there has already been a lot of stimulus (malinvestment) since 2008. Also there is the problem of compounding of large numbers. The multiplier at this rate would be 4.66 – the multiplier for the US growing at 2% would be 1.48 On a per capita basis the Chinese consumption would be about 80% of the US consumption level in 20 years. Not a likely scenario. 1) You assume all stimulus is malinvestment. Never a good idea to begin your argument with an assumption, otherwise you end up invoking the “T” word. 2) What multiplier? There are many. It is doubtful that China has only “temporary” problems. I am also curious isn’t Zarathustra following the Japanese model of infrastructure projects to forestall economic contraction in his advocacy of stimulus at the central and local government levels in China? The Chinese government policy of state bank roll-over and cancellation of enterprise debt creates a high level of competition that drives down prices allowing cheaper prices for government spending on physical and social infrastructure. nobody wants the yuan. It’s worth less. not more. no future value or yield there. it’s not a good investment, so it is being exchanged for other forms of currency and stores of value. says a lot about china. essentially a vote of no confidence. and printing does not buy confidence, so they have a problem. Margaret Travis paused in the empty foyer of the cinema, looking at the photographs in the display frames. In the dim light beyond the curtains she saw the dark-suited figure of Captain Webster, the muffled velvet veiling his handsome eyes.